| Just as awesome as the first two. Skadoosh! There's a reason why the "Kung Fu Panda" franchise is one of the most successful of all-time, and I'd like to believe that that reason is because the writers and the creative talents behind it know how to solidly move the story forward, even with the same characters, they know how to make them evolve without losing the charm and the heart that made the first and the second film effective. 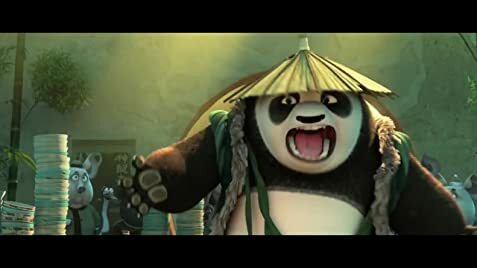 In KUNG FU PANDA 3, Master Shifu appoints Po as the new teacher, a responsibility that of course Po is not able to handle, because he feels more comfortable just being the dragon warrior that saves the village whenever they need help. But that's the thing, once you've felt comfortable and you do only what you can, then you close any room for growth. But being a teacher is not Po's only new challenge. We know that it was just a matter of time until Po reconnects with his family, it was teased at the second film's end. Po's long-lost panda father reappears, just as the supernatural villain Kai, from the spirit realm, returns to the mortal world and vows vengeance. Each film has a certain kung fu style or a goal that Po must achieve, and in this one he has to master the Chi while at the same time learning to know what it means to be a panda. I had concerns at first because "Kung Fu Panda 3" is released this month, and you know that January is a dumping ground for terrible movies. But now I see that this may actually have been a smart move on the studio's part because this is quite possibly the only great film this month, people will turn to "Kung Fu Panda 3" because everything else will disappoint them. Just like the first and the second film, KUNG FU PANDA 3's animation is sharp and beautiful. The action sequences are fun and entertaining, and there's a little bit of a fish-out-water situation as well because our hero Po is pretty much new to this whole Panda village and they way they do things over there. But what rings true throughout all three films is that it's ultimately about Po's journey to become one with who he is. He accepted his destiny despite people's doubts, he let go of the past and found inner peace, and now he's put to the test once more, his confidence will be tried once more, and so seeing him be the underdog again is why root for Po. And on top of that, KUNG FU PANDA 3 never runs out of ammo to get you to feel emotional and they do it without trying too hard because it's done in a way that serves the story and the characters, the emotional scenes make sense, I often say that "Kung Fu Panda" movies faithfully follow Pixar's manual — the undeniable importance of a well-written story; one that goes straight for the heart and aims to inspire. KUNG FU PANDA 3 is simply awesome! And it's so cool if you think about it, this is an animated family film franchise that gets more and more solid with each installment, and that's rare. Wayne Knight, who voiced one of the pandas in the panda village, had also been in Kung Fu Panda (2008), as the voice of the Gang Boss, from Po's dream at the start of the movie, from which Kai had been inspired. Instead of the usual Dreamworks SKG opening with the little boy fishing from a crescent moon in the sky, Po climbs a huge staircase, jumps onto the crescent, and fishes from there. The FX print begins with the 2013 Universal Pictures logo plastered over the 2010 20th Century Fox logo.